The Cedar Summit Brookridge should be on the top of the list for those who are shopping for a wooden swing set and are not only on a budget but also have a smaller space to work with in their backyard. 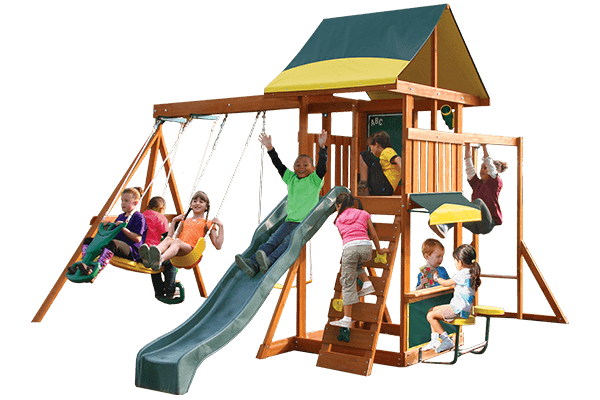 This attractive playset has nearly everything kids and parents want packed into a play structure that only requires a less than 13’ x 13’ space. When you choose a Cedar Summit swing set for your family you can be assured that you will be getting a quality product that is safe, affordable, and easy to assemble. Their goal is to “develop products that allow children’s imaginations to grow in a safe and playful environment.” From conception to development to customer service they have your kids’ best interest in mind. 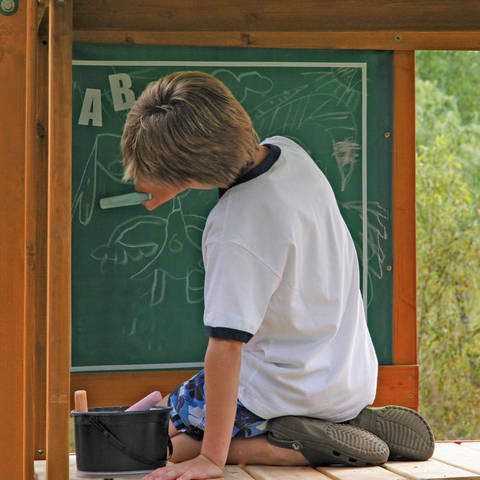 Find out more about the Brookridge which is just one of their many quality wooden playsets for active and imaginative children. 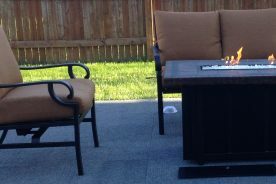 1 What is Included with the Brookridge Swing Set? 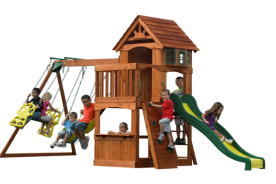 2 How Big is this Cedar Summit Playset? 3 Can I Put the Cedar Summit Brookridge Together Myself? 4 What Maintenance is Required on this Swing Set? 5 Is There a Warranty on the Brookridge? 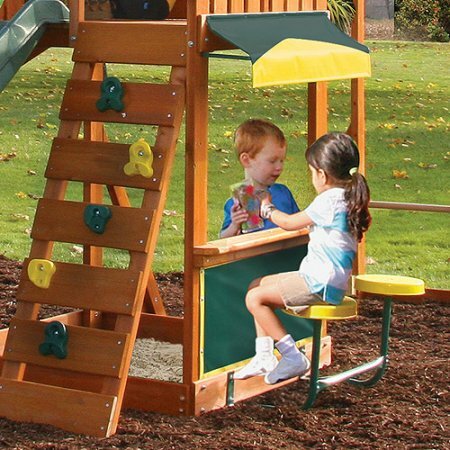 6 Where Can I Purchase this Cedar Summit Playset? What is Included with the Brookridge Swing Set? Built around a clubhouse that sits four feet off the ground the Brook Ridge has a swing beam off one side that houses three different swings. Off the back kids will love making their way across the monkey bars while the front has a quick moving slide and a ladder for climbing. For the most imaginative kids in the bunch there is a café window with stools. The clubhouse itself has some great features like a chalk wall and telescope under a colorful canopy roof. The solid cedar swing beam on this swing set comes equipped with three places for swings. It includes two yellow belt swings with ropes and a two-person glider swing. 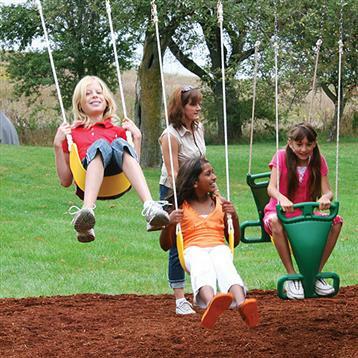 The glider swing is green and allows for two children sitting back to back to swing at the same time. The high rail wave slide on the set makes zooming back to the ground extra fun. Attached to the front of the clubhouse, this slide has a bump in the middle for that added excitement. Its high rails on the sides make it a safe activity for kids of all sizes. The slide comes in green, is 84” long and sits 48” off of the ground. The Brookridge offers the monkeys in the family two different options for accessing the upper clubhouse. The rock climbing wall offers adventure and safety with its multi-colored rocks and its ladder rungs that provide another area to hold on. Kids can also swing across the monkey bars on the back into the clubhouse after climbing the ladder on the end. Once inside the upper clubhouse kids can let their imaginations run wild. They could be on a ship using the telescope to look out for pirates. Or maybe they’re in a cave writing hieroglyphs on the vinyl chalk wall. Whatever they choose to be they’ll be shaded by the attractive multi-colored canopy roof. Underneath the clubhouse is 38.5” x 32.5” area that is open for play or can be used as a sandbox. The frame of the swing set provides an enclosed area that can be filled with sand for another great outdoor activity. This area does not come with a cover and you will need to provide your own sand. A unique feature to this playset is the café table on the lower level. This cool window gives kids a place to rest, enjoy a snack, or imagine they’re in a restaurant. It has a cool colorful awning and two stool seats. 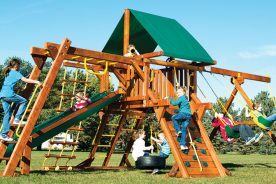 How Big is this Cedar Summit Playset? The Brookridge is designed to be a moderately sized set that will fit nearly any backyard while still being packed with activities. It can accommodate up to 9 children at one time so your kids and all of their friends can play at once. 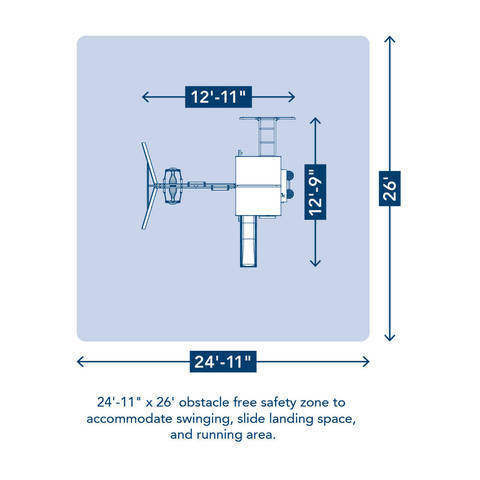 While the swing set itself is only 12’11” long x 12’9” W, it is important to leave a safety zone around the set when installing it to leave space for running, swinging, and landing at the bottom of the slide. See below for more specific dimensions. Can I Put the Cedar Summit Brookridge Together Myself? 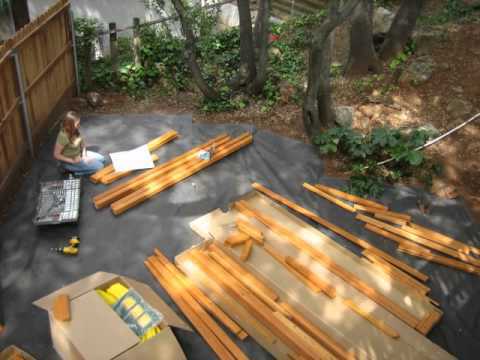 One of the greatest things about a Cedar Summit playset is that they are all designed to be simple to construct and install so you can do it yourself. That being said, it is very important that you follow the instructions so that the playset is installed correctly and provides a safe place for your children to play. Each set comes with a detailed, step-by-step instruction manual that is illustrated for your convenience. It also includes a parts list, tips for protective surfacing, directions for anchoring your playset, and information for contacting their customer service team in case you need help throughout the assembly. You can also visit Cedar Summit’s Installation Page on their website for guidance through each step of installation from preparing your yard to maintenance tips. Their tips and videos can be found here. What Maintenance is Required on this Swing Set? 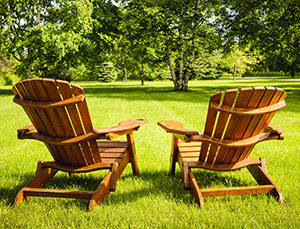 The Cedar Summit brand prides itself on producing high quality wooden swing sets that are made from 100% cedar lumber. All of the wood components come pre-cut, pre-drilled, and pre-stained with a child safe stain that is applied in the factory. Their accessories and hardware are also designed to be safe and durable. However, like any wood structure that is continuously exposed to the outdoors, your swing set will eventually start show some wear. That is why it is important to perform routine maintenance and regular inspections to not only extend the life of the swing set but to keep your kids safe while they play. This particular manufacturer recommends doing various maintenance at different times throughout the year. The chart below describes things that can be done twice per month, once per month, and at the beginning and end of each play season. Checking over the wood components as well as the hardware, ropes, plastic components, and ground anchors should all be included in your maintenance schedule. Check metal parts for rust. Sand and repaint if necessary. Check for sharp edges or protruding screws. Inspect protective surfacing for proper depth. Remove any foreign objects. Check for looseness in ground anchors. Replace if necessary. Oil swing hangers if squeaking occurs. Reinstall swings and rides. Make sure all ropes are tight and all parts move freely. Check wood for deterioration and splinters. Sand or replace parts if necessary. Apply exterior water-proof stain or sealant. Inspect and tighten any loose hardware. Check for sharp edges or protruding screws. If needed, add washers. Rake and check the depth of protective surfacing. Make sure swing hangers are secure and hooks rotate freely. Check swing seats, rope, chains, and other attachments for wear, fraying, or damage. Replace if necessary. Remove swings and other plastic parts and store indoors if outside temperatures reach below 32 degrees. Rake and check the depth of protective surfacing. Remove foreign objects. Is There a Warranty on the Brookridge? Like most trusted brands of wooden swing sets, the Brookridge from Cedar Summit does come with a limited warranty. All of the lumber is under a 5-year warranty which covers structural failure that may be caused by rot or insect damage. All of the other parts including hardware, swings, ride-on toys, slides, and other accessories are under a 1-year warranty from the date of purchase. This warranty does not cover damage that comes from natural wear and weathering of wood. It also does not cover damage that may occur if the product is installed or used incorrectly. It is recommended that this swing set only be used in residential areas. Warranty claims may be voided if being used in a non-residential location. Where Can I Purchase this Cedar Summit Playset? The foremost retailer that carries this swing set is Walmart. While most of the locations do not carry this swing set in-stock it can easily be purchased online and shipped directly to your home. You may also have the option of shipping it to your nearest store where you can pick it up in order to save on some shipping costs. It is also possible to find this product on Amazon as long as supplies last. Depending on the supplier to Amazon there may some additional shipping charges that will apply. If you’ve been searching for the perfect swing set that isn’t going to break your budget, the Cedar Summit Brookridge might be just what you’re looking for. It typically sells for less than $500. And while it may look small and seem cheaper than a lot of wooden swing sets you have seen, you can be assured you’re getting a quality product that is packed full of fun and accessories.